Perfect dip for a celebration! Set aside 3/4 cup (175 mL) rinsed and drained black beans. In a food processor, combine remaining black beans, salsa, flaxseed oil, ground flaxseed, sour cream, cumin, salt and hot sauce. Puree. Remove from food processor. Stir in reserved black beans and cilantro. Spread 1 cup (250 mL) of sour cream in the bottom of an 8 x 8 inch (20 x 20 cm) pan. 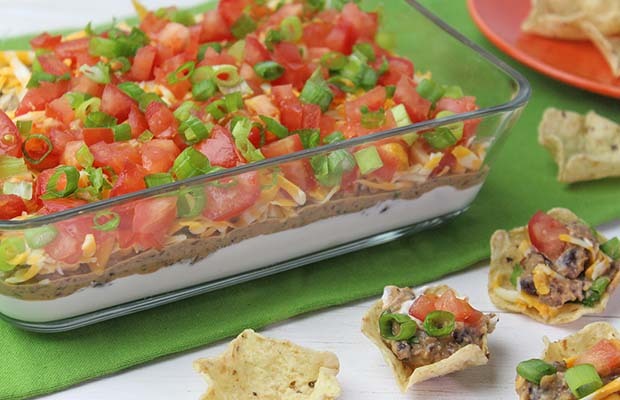 Spread black bean layer on top of sour cream. Sprinkle with cheese and top with tomato and onion. Refrigerate for at least one hour. Serve with carrot sticks, celery, red pepper slice, pita wedges or bite sized tortilla chips. Yield: 4 cups (1 L). Serving Size: 1/2 cup (125 mL). Each serving contains 1 1/2 tsp (7 mL) of flax.